It took Francois Truffaut in Close Encounters to work out how to communicate with the aliens. Before that they just spoke English and got down to the business of planet acquisition. The tv series V in the early '80s had its reasons for Anglophone E.T.s and they made sense. The goopies from the deep in The Abyss spoke in slideshows that even alpha-oaf Ed Harris could understand. So what happens when you get apparently peaceable aliens hang above the Earth in seamless hollow boulders waiting for someone to say hello? You get Amy Adams whose thousand and one ways of facial control allow her to emote intellect. Coming from the tragedy of losing her daughter to cancer, Adams' Dr. Louise Banks finds her linguistics class interrupted by news of the aliens landing. Soon enough Forrest Whitaker's Colonel Weber knocks on her office door to give her the job of outreach. The language she is presented with is more like industrial noise and she begs off. A visit to her rival later and she is whisked off at midnight to the American landing site (there are eleven others around the world linked by two things, one intriguing and the other intentionally hilarious). There she meets the team and ascends in a beautifully realised transition to the giant stone craft to have a crack at communication. Meanwhile the world of international and perhaps even intergalactic politics tenses up as this place heads for conflict with the newcomers and that place falls into chaos. The race is on for the world's good guys to find out what the visitors are doing in the backyard. Louise uses some nifty logic to scratch the surface of the language barrier through the use of an extension of human language. From this point they will or won't find the answer and the Earth will or won't be either conquered by hostile aliens or plunged into self destruction. And that's where this film's problems begin. First, just when Louise gets her break and digs into the problem solving we are robbed of a scene or even a montage of her getting further to the point where she can communicate in real time. We do get a montage but it's narrated. From this point, were it not for Adams' screen magnetism, we would be cast off from the film's dock. The narration isn't complex. The points it makes are clear and logical and bring us to the next major point but we feel as we might in those re-released films with reconstructed passages made of meagre newly discovered footage and onscreen notes. Except there's a reason for those to look gaffer taped together. Here it just feels like the other side of the too-hard box. The rest of the film must struggle to regain its sense of wonder and the tension of its moment. There is a clever idea on the way but by the time we get to it we've already guessed most of it and the lost impact at its revelation weighs heavier than the moment we should be hoisted by. Actually, by that point the film starts feeling like a Christopher Nolan epic (albeit about a month shorter) in which the human story at its heart is shown to be what was important all along and everybody feels nice. The idea is still clever, mind you, it's just buried under a stack of warm pancakes. 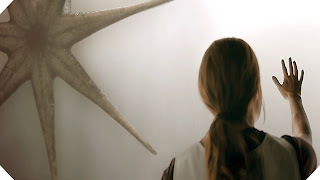 Arrival is not so much about the alienness of species or even races but the alienness of language itself, how different translations can mean the difference between war and peace both between and within languages. This premise is given with an effortless compulsion by the film (even the few lines about the strangeness of Portuguese among its neighbouring languages, given as a scene instensifier, are compelling). The road to discovery about the language of the aliens has a dark momentum to it which is given such thrilling weight in the gravity shifting scene of the first interspecial encounter we see (initially announced by a quick shot of a tablet whose screen rotation is lost and starts spinning like a fan). If we thought this was going to be a tough assignment before this moment we now know how tough. It's cinematic greatness. And then it gets vacuum-packed into a montage with a voiceover and we start floating on the Zoloft of the bigger picture. Director Denis Villenevue has done so much to impress already. He's good with actors and concepts. And the flair for cinema he has shown with Incendies, Enemy and Sicario has assured him a place among the best of his generation. Whether he's wresting stark allegory into a story of deep existential horror (Enemy) or coolly drawing the slippery connections between pragmatism and corruption (Sicario) he conquers the screen with them. And he does so with an eye to the comfort demanded by a mainstream audience. Here, as in Prisoners, he seems to have dropped a strange looking pebble to pick up a shiny coin. I can only hope he doesn't believe the hype building around him and turn into the next Christopher Nolan ("Your movie took four hours of my time to tell me THAT? You are not Tarkovsky!) Maybe he should try a musical next, something that will make him work. I'm serious.